I've gotten more than my fair share of hatemail over the past few months. I'm not surprised by it. Every time a hero appears and begins to change things for the better, there are going to be small-minded people who oppose him. My Agents represent me, which means they're likely to get similar treatment from these villains. Today I would like to share the EVEmail that currently holds the record for the longest ever sent in complaint of the New Order. This came to me courtesy of Agent Tubrug1, the recipient of the EVEmail. First I'll show the whole text. Don't reach for your reading glasses just yet, we'll zoom in on it and unpack the insanity one piece at a time. Quite a mouthful! Who's responsible for this madness? The man you're looking at is JulioGulio Valcores, the Vice CEO of System Shock Inc.. You may recognize the name of that corp, because it belongs to Heavy Met4l Queen, the self-proclaimed leader of the resistance against the New Order. 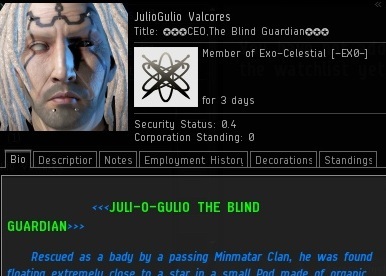 Julio is the author of the EVEmail. Let's have a look! That bit of text at the top is actually the subject line of the EVEmail. Because if you were looking through a bunch of EVEmails, that subject line would definitely help you find this. The first chunk of the EVEmail. One thing you'll notice, in addition to the lack of spelling, grammar, capitalization, puctuation, and paragraphs, is the lack of sentences. That's right, the entire EVEmail is comprised of one run-on sentence. This first chunk relates to Julio's argument with Tubrug1 about a wardec. Heavy Met4l Queen got her corp into trouble with some New Order loyalist corps, resulting in wardecs. 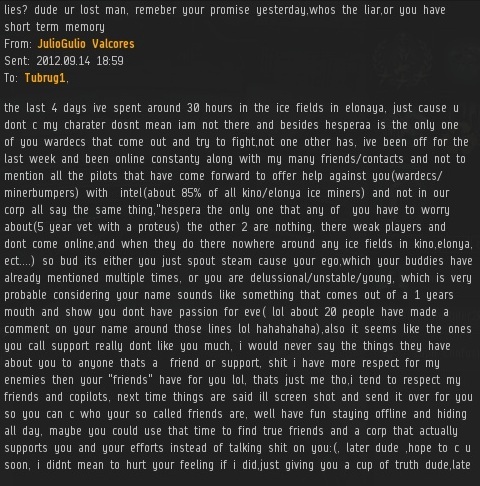 The next part of Julio's complaint is about Tubrug1's name. He doesn't think it shows much passion for EVE, and apparently a lot of people agree with Julio on that point! The narrative then turns toward an attempt at driving a wedge between Tubrug1 and other New Order Agents. Julio claims a lot of Agents are secretly attacking Tubrug1. The New Order will devour itself! This is JulioGulio Valcores today. He is no longer affiliated with System Shock Inc., and has moved on to greener pastures, forming his own corp. Gone from his bio is all mention of his support for Heavy Met4l Queen and his distaste for bumpers. We shouldn't be too critical of Julio for leaving HMQ's corp, though. Pretty much everyone else left, too. System Shock Inc. has gone from 20something members down to 3. Such is the fate of those who oppose the New Order. Your ignorance has always been your greatest weakness. and i see that now more than ever james. Its unfortunate you can't see the bigger picture that's unfolding. I was expecting more from you. Dont dissapoint me james. think. i won't have your new order bliss consume your mind. Think! 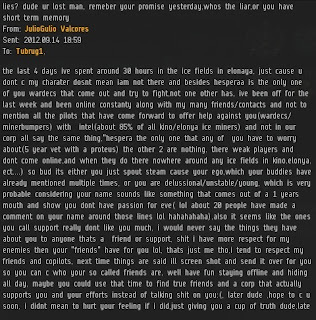 Yey angry carebears; you should wardec more the james and then complain to CCP about how war mechanics are broken. Is this the real Heavy Met4l Queen or a fantastic new cryptic threat bot? What the New Order has seen unfolding so far were smartbombing merlins, counter-bumping hookbills, a ton of fail(! )-fit ganking ships and gallons of tears. Why don't you actually do something, succeed, and then brag about it rather than bragging about some future eventuality that most people are sure will never happen? 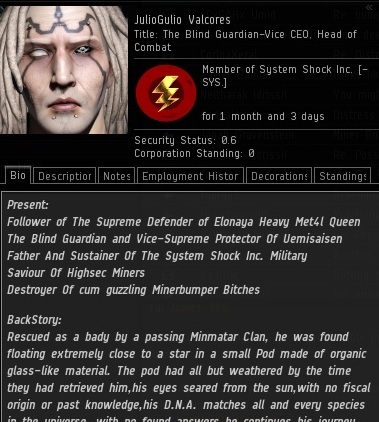 Highsec miners in wardeccable corps?! This is probably the dumbest thing I've seen besides 50B freighter killmails. Ah, so that's what he meant. That's not at all Arctic Dungeon fault if the corporation fell. System Shock Inc. has had some recent internal issues. Apparently a new member stole a whole bunch of their stuff.